April, 2014 | H&R Group K.K. When it comes to alcoholic beverages, the Japanese are most proud of its sake and rightly so. However, while sake is one of the most recognisable totems of Japanese culture, outside of the country, you’ll be hard pressed to find many people who regularly drink it. 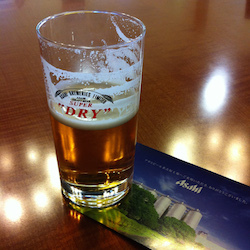 Yet, when it comes to Asahi Super Dry, it is a different story altogether. Pretty much every sushi or noodle bar worldwide is stocked with the famous silver bottles. Asahi is of course one of Japan’s biggest brewers, which means that vast quantities of beer are made in factories all over the country. One of them is here in Nagoya and, for absolutely no charge, you can take a trip around. After getting picked up from Shin-Moriyama station on the free shuttle bus you can be led around the factory floor to learn about the beer making process and history of the Asahi company. You can witness the marvel of modern machinery, and hide your jealousy of the official beer tasters whose job is to sip two bottles of beer every day. Around three hundred people take the tour daily, with coach trips coming from as far as China and Korea to see how the famous beer is made. However visitors wanting to see the factory in motion must visit on weekdays and non-holidays, as the factory closes on Saturdays and Sundays. Should you visit on one of these days, you will instead be shown an interesting film of the factory in full flow. The tour itself takes approximately 55 minutes to complete, and at the end you are shown to the bar. There you have twenty minutes to test three of Asahi’s main draft beers: Asahi Premium, Asahi Black and, of course Asahi Super Dry. There is a three drink limit, however anecdotal evidence shows that this is not always strictly adhered to. For those who do not wish to drink beer, are under 20 years of age, or are driving there is a wide range of soft drinks to choose from. There is of course the somewhat obligatory tour gift shop, but it is unobtrusive and, well, it sells beer, so there can surely be no complaints in that department. After you have finished your shopping, should you be so inclined, the shuttle bus can return you to the station. The tours are available daily from 09:30 with the final tour starting at 15:30. If you don’t want to take the free bus, the factory is a fifteen minute walk from Shin-Moriyama station. Reservations are a must and tours in Japanese can be booked online (www.asahibeer.co.jp/brewery/nagoya/). If you would like to be accompanied by an English speaking guide these can be arranged by calling 052-792-8966 between 08:30 and 17:00. Kobe is the sixth-largest city in Japan and is the capital city of Hyōgo Prefecture. It is located on the southern side of the main island of Honshū, on the north shore of Osaka Bay and about 30 km (19 mi) west of Osaka. With a population around 1.5 million, the city is part of the Keihanshin metropolitan area along with Osaka and Kyoto. When relocating to Japan you may find yourself unable to give up your family pet for the duration of your life in Japan, but don’t worry because you don’t have to! The process of importing a pet into Japan is time consuming, but it is not hard. One thing you may want to consider though is that bringing a pet with you to Japan will significantly impact the selection of properties available to you. Less than 10% of available properties will allow you to keep a dog, specifically a small dog. Big dogs and cats are a real challenge to accommodate in Japan, and will seriously limit your options. That being said, sometimes leaving a pet home feels like leaving a child home so the sacrifice may worth it; I know I would never leave my cat home! In order to bring your pet into Japan you will need to start well in advance. Fully satisfying the import regulations you must comply with will take at least 7 months from the date of the first rabies vaccination. The Japanese Animal Quarantine Service (AQS) is the official source of information regarding the import and export of pets in Japan. We recommend you familiarize yourself with the timelines and procedures available on their site. The main requirements are listed below. With proper advance planning some pets will only require a quarantine period as short as 12 hours. If your pet meets all quarantine requirements on arrival, then you may be able to take them home with you on the same day. Dogs and cats must be individually identified by microchip in either the ISO 11784 or 11785 standards. Dogs and cats must be immunized against rabies with inactivated or recombinant vaccines at least twice after the microchip is fitted. For the measurement of rabies antibody levels. 4. 180 day waiting period. Dogs and cats are required to undergo a waiting period of at least 180 days between the date of the blood sampling and the date when dogs and cats arrive in Japan. The importers need to obtain a certificate issued by the responsible government agency of the country of export stating the previous details; the First-step to the Fourth step have been completed. 6. Import inspection on arrival in Japan. AQS information pertaining specifically to cats and dogs can be found Here. If you want to ship your pet to Japan separately as cargo you will need to contact the airline. Many airlines will NOT transport pets between May and September due to the heat, or between December through February due to the cold. This is to protect your pet, as during some portions of its journey it will be staged in non-climate controlled areas of the airport that would endanger your little friend. After confirming that your airline will accept your pet, you need to make arrangements to have someone meet your pet up at the airport cargo terminal and complete the necessary paperwork before accompanying your pet to the quarantine facility. Due to the language barrier in Japan, it may be easier to have a professional pet transportation company assist you with the preparation of documents and transportation arrangements. Please see the Independent Pet and Animal Transportation Association International Inc.’s (IPATA) website for more information on companies that can assist with transporting pets all over the world. A company that comes highly recommended is Pet Relocation – http://www.petrelocation.com/. They are able to assist in door-to-door services, including import/export documentation, veterinary procedures, booking of airline tickets, boarding accommodation and more. Pet Relocation has been in business for over 40 years and offers customers a 100% customer satisfaction guarantee. Please take a look at their website or call 1-877-738-6683 for quotes and further information. Depending on the size of your pet, there are several options of room type and size in quarantine. The price depends on the size, but an average space is about JPY 4000 per day for food and lodging. You will be able to visit your pet during visiting hours, and it is also possible to send your pet’s favorite foods, snacks and toys with them. When the quarantine period is over, you may go in person to pick your pet up at the kennel. Alternatively, the facility staff can make arrangements to deliver your pet to your home. Please note that all quarantine related payments, including the delivery fee if you choose this option (approximately JPY 20,000), must be completed prior to your pet’s release. Besides mailing your pet, there are a lot of ways to get them home with you from the airport. Here are a few options. Train – Your pet must be in a cage. There may be size restrictions or “excess baggage” charges; please contact the specific train line for details. Limousine Bus – Most will allow pets in cages, but again, there may be size restrictions or “ “excess baggage” charges; so please contact the bus company for details. Subway – Your pet must usually (depending on the company) be under 10kg and in a cage. However, again, there may be size restrictions or “excess baggage” charges; so please contact the company for details. In Japan, you must register a dog (but not a cat) at your local city ward office. When you do this you will need to take the Quarantine Certificate you were given at your port of entry. You only need to do this once in Japan, although if there is any change in status (i.e. the dog is lost, your address changes, or you leave Japan) then the city ward office must be notified. If you live in an apartment, your pet will need to be placed in a carrying case or held in your arms when crossing or utilizing common areas such as the lobby and elevators. Unlike some other countries, people here basically always pick up their pets droppings. The easiest way is to carry a plastic bag with you whenever you take your dog outside. Dogs may not run loose. Your dog must be on a leash at all times when outside. “No dogs allowed” signs in Japan are usually easy to understand even if you cannot read Japanese. Please be on the lookout for these signs and stay out of restricted areas. Pets are required to have a rabies vaccination every year. The ward office will send you a reminder to vaccinate your pet in Japanese. You should then contact one of these English speaking veterinarians and schedule an appointment. These are some veterinarians with English speaking staff in Nagoya.